This is the fourth Star Wars Jedi Training Academy Certificate I have developed since I started this Star Wars blog/website in 2010. Actually, the original one I created in 2008 for a screening party we held for The Clone Wars. The first Jedi Training Certificate I hosted on DocStoc, which worked well for years and was #1 in Google Search for years. Then DocStoc made it private. I remade it in 2013 and hosted it on DocStoc, but it lost ranking for being a copy. So then I posted it on here instead. Between those various previous certificates, they have been printed and used for many Star Wars Parties. The old one is still available, but I must say it's dated and I really wanted to make some new ones for y'all. And since being a Sith is cool in some circles now, I will make up a free printable Sith Cert soon too, but for now, I hope this one will help those of you looking for cheaper ways to throw Birthday Parties for your Star Wars Kids. 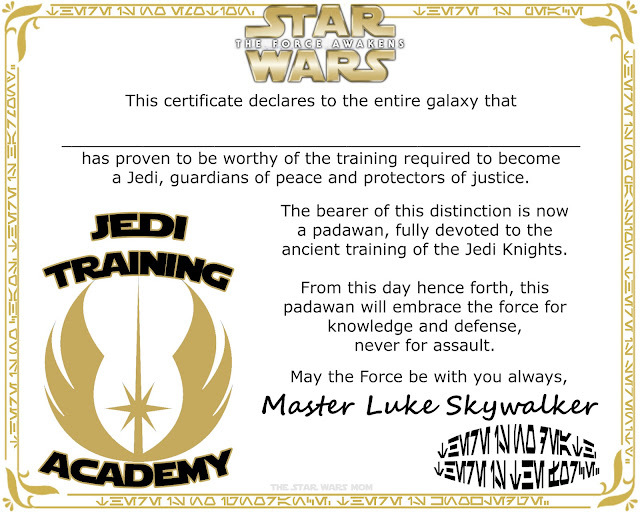 I made this Jedi Training Certificate to coincide with The Force Awakens. The Aurebesh writing (the writing seen on the podracers) around the border and in the lower right hand corner are the Jedi Code. Here it is for those of you interested.